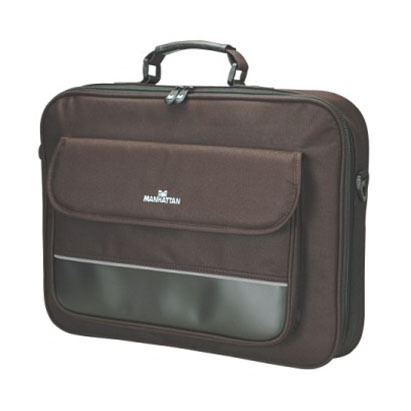 Always measure notebook computer exterior to determine compatibility. All bag dimensions are approximate and may slightly vary. 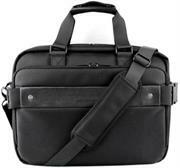 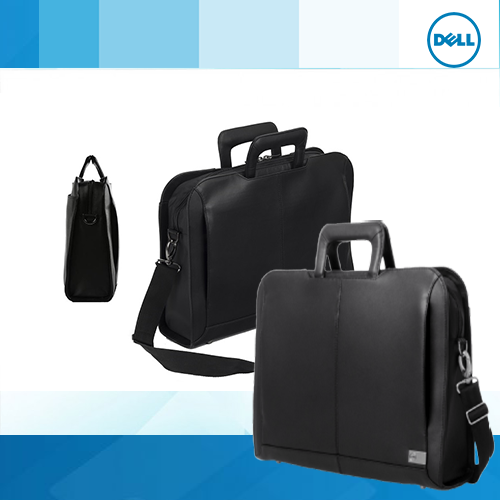 Carry and protect your Laptop in style with the Leather Carrying Case from Dell. 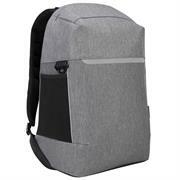 Protect your tech from theft as well as bumps and scratches with this innovative new backpack from Targus. 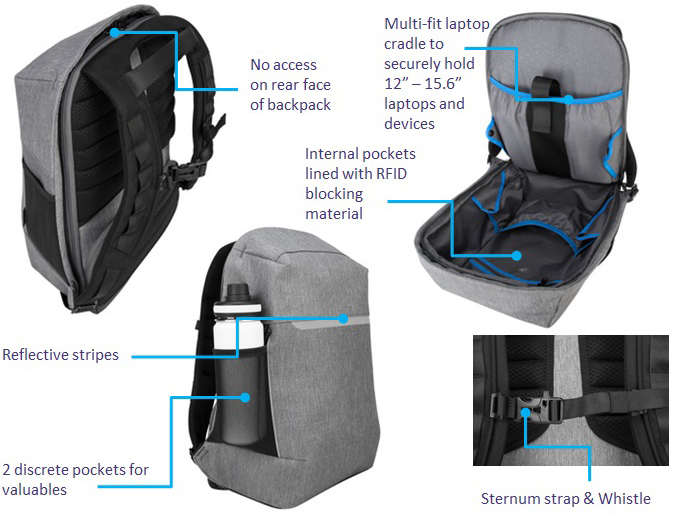 The inside of the backpack can only be accessed via zips around the shoulders, protecting you from opportunistic thieves, while the RFID-blocking pockets protect your credit cards from scanning. 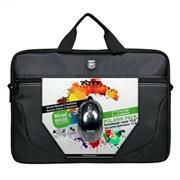 Not only is it secure, it looks good too. The CityLite range marries contemporary cool and top-of-class protection to create the perfect laptop bag for stylish urban professionals. 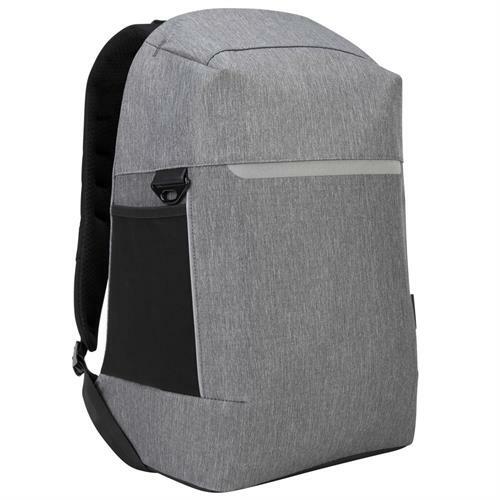 With its multi-fit laptop cradle, intelligent design and premium materials, this modern backpack protects laptops and devices up to 15.6” while sporting a fashionable, hard-wearing look that lasts. The Macaroni Pelle 15.6" Soft Messenger briefcase is specially designed to combine distinctive style with solutions for transporting all the digital accessories today's lifestyle requires and importantly stands up to daily wear ‘n tear. 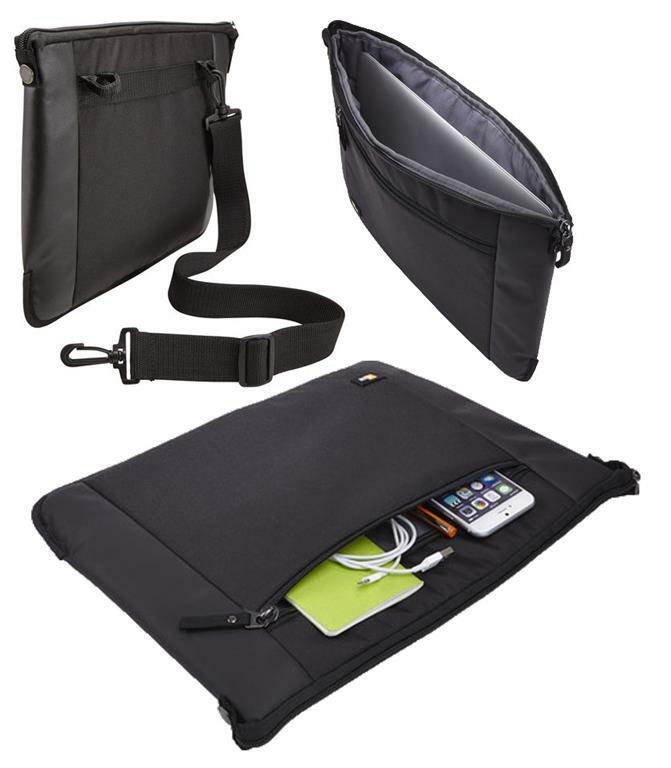 Included is an adjustable padded shoulder strap and easy carry handles. 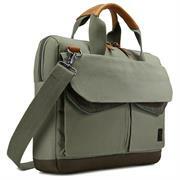 This bag is unisex and ideal for School, Office, Everyday use and Travel. 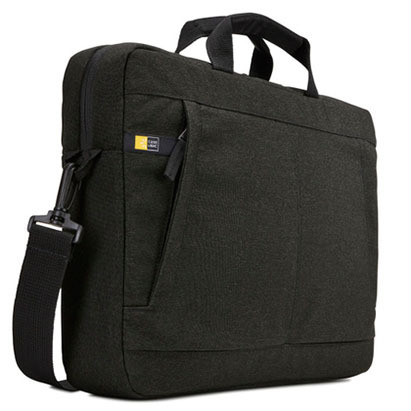 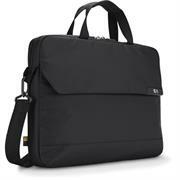 This case constructed from lightweight yet durable ballistic 1680 denier nylon fabric also features a lightweight padded notebook sleeve to hold laptops with up to 15.6" screens and enough storage pockets for any extra accessories such as high-tech gadgets like a Tablet PC’s , Smartphone, power adapter, and mp3 player. The Macaroni Pelle Messenger case also features a large outer file compartment for paperwork, books and more as well as two zipped pockets on either side for all your other essentials such airline tickets, passports etc. that you need to carry without adding extra weight. 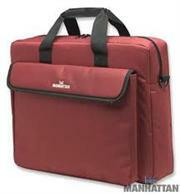 • Multi-compartments provide storage for cards, pens, iPod, smartphone, etc. 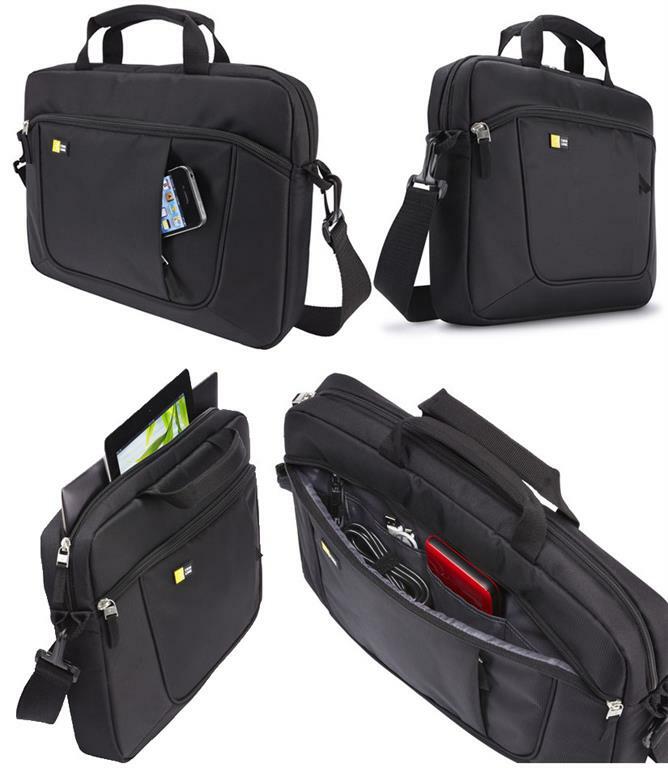 Port Sydney 13" to 14" Urban & Modern Laptop Bag Urban & modern elegant design Padded laptop compartment & dedicated tablet pocket Comfortable handle Design metallic logo, pullers & buckles Dedicated Smartphone pocket Back trolley strap Adjustable & removable padded houlder strap Front pocket with large organizer , Retail Packaging, 1 year Limited Warranty. 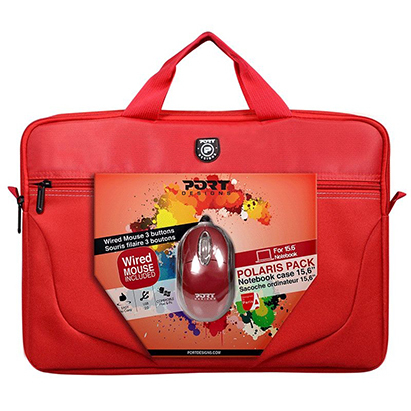 Port Polairs 15" (not 15.6") Polaris II Bundle Laptop Bag and mouse - Top Loader Bag and USB Mouse - Red, Retail Packaging, 1 year Limited Warranty. 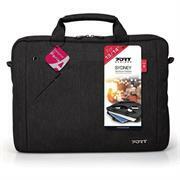 Top Load, Fits Most Widescreens Up To 17"
Stylish and efficient for mobile professionals. The exterior and interior are carefully constructed of lightweight, durable, easy-care materials that resist water and wear. Heavy-duty hardware — including zippers with sturdy pulls — ensures smooth operation with fewer snags. 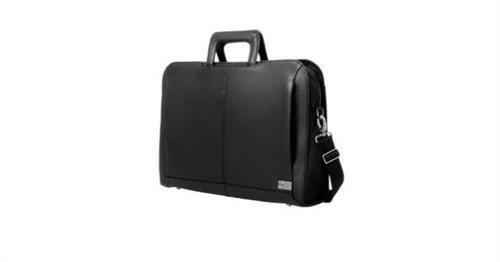 MANHATTAN Notebook Computer Cases combine superior computer protection and attractive styling with comfort and convenience when travelling across town, cross-country or around the world. 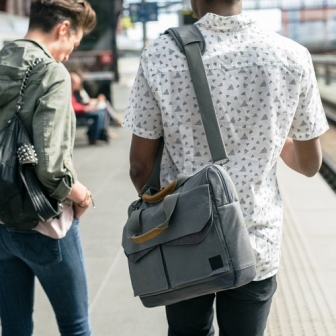 • Top Load, Fits Most Widescreens Up To 17"
Designed for your "everyday adventure," the Manhattan Dashpack offers the cargo-carrying capability of a lightweight backpack in a sporty, stylish sling design. 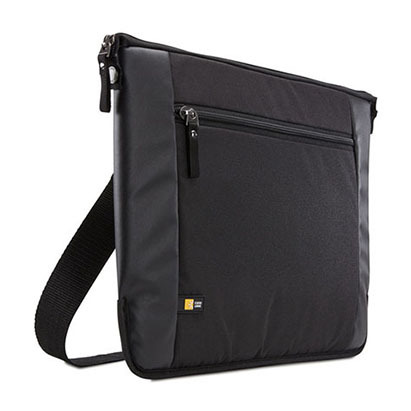 The main diagonal zippered compartment features a padded pocket for storing up to a 12" tablet (iPad, Galaxy Tab, Kindle, Surface, etc. ), Chromebook or Ultrabook and plenty of space for books, a change of clothes or other items. 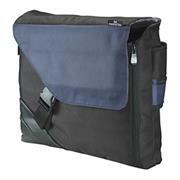 Zippered carryall pockets at the waist are ideal for business cards, loose change and other small cargo. Plus, the Dashpack features a padded, ergonomic shoulder strap with mesh phone pocket and ambidextrous connectors for left- or right-side carrying. 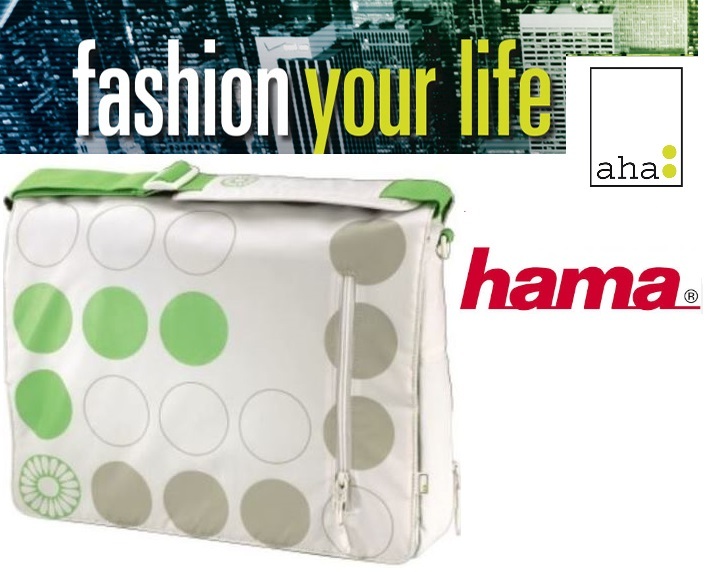 • Padded internal pocket for most tablets and Ultrabooks up to 12"
The Hama 17 inch Messenger Notebook Bag “ AHA” Series is a Trendy , Eye catching , Coloured , Cheerful and Creative that will demand attention from passers-by. 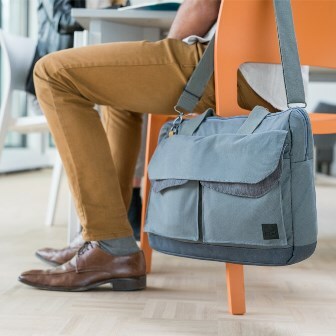 This original Aha messenger bag has a large main compartment with a padded, removable Notebook compartment with inside lining allows you to safely and securely store your Notebook in the main compartment without it moving around or getting scratched, while still leaving plenty of room for any paperwork you may have. The large padded computer compartment protects and accommodates most notebook computers with widescreens up to 17". 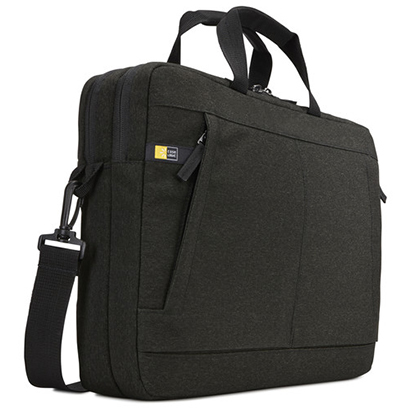 The top-load design quickly and easily helps business travelers unload and load a notebook computer at airport security inspections. 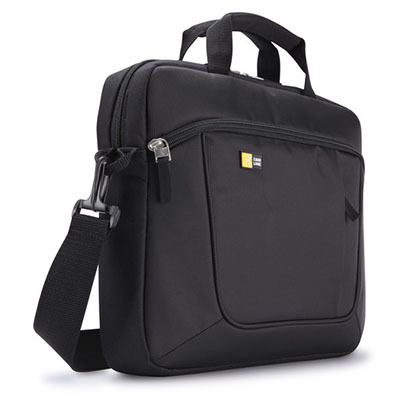 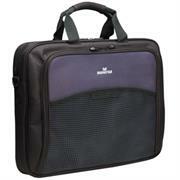 Lightweight and roomy, it makes an ideal mobile computing workspace. 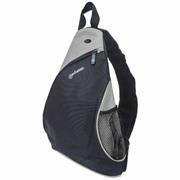 The exterior and interior are carefully constructed of lightweight, durable, easy-care materials that resist water and wear. 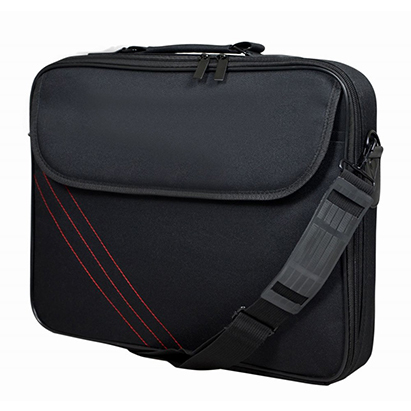 Heavy-duty hardware including zippers with sturdy pulls ensures smooth operation with fewer snags. 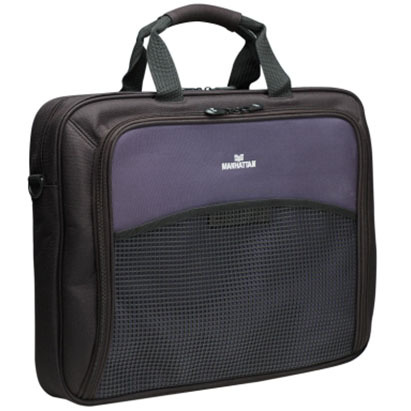 MANHATTAN Notebook Computer Cases combine superior computer protection and attractive styling with comfort and convenience when traveling across town, cross-country or around the world. 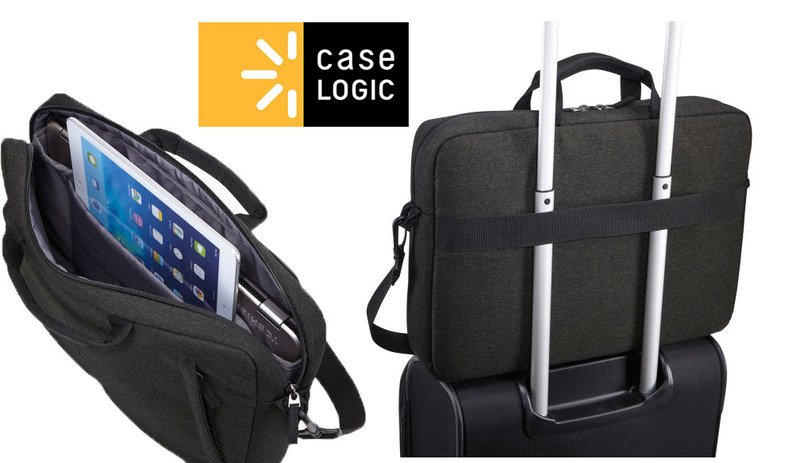 Anti-theft Luggage Zipper Strap-We’re presenting a security announcement today surrounding the protection of your valuables while traveling. The technique of using a ballpoint pen to open any luggage utilizing a zipper, is one that’s been publicly disclosed for some time now. There are unfortunately many that aren’t aware of this risk, or that it leaves no tell-tale sign that the suitcase has even been tampered with by simply shoving a ballpoint pen into the zipper track, you can pull the suitcase lid open and access the interior contents. 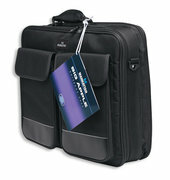 Then with a simple movement of a still-locked zipper slider you can reseal the suitcase without leaving evidence of tampering. 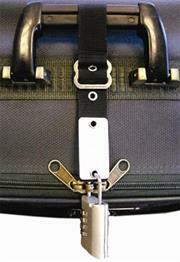 The fact of the matter remains that any suitcase, luggage or pack that utilizes a zipper is susceptible to this attack. Introducing the Anti-theft Luggage Zipper Strap that will at least either secure the interior contents of your suitcase or provide evidence that your belongings have been tampered with. ● Reusable - you don't throw these away"